The taking of one’s own life is the highest expression of our autonomy. This was the basis for the treatise on self-homicide by the 16th/17th century poet and clergyman, John Donne, in Biathanatos in which he questioned the ‘right’ of the Christian church to dictate this act of individual autonomy: to call it a sin and outlaw it. What Dr Kevin Yuill makes clear in this book, from the outset is that the issue is not one that is clear cut. The matter over whether to call the action assisted suicide or assisted dying is not simply a matter of semantics. The ending of a life must come at the request of the person themselves, to look on this as anything other than suicide raises serious issues of moral responsibility. The use of the word ‘dying’ is really to fudge the central issue, which is suicide: an act which the suicide brings upon themselves. To think of it as assisted dying means that the moral responsibility becomes ambiguous: Is the ending of a life the responsibility of the doctor who provides the means or is it with the suicide? I am not convinced that permission given to a doctor to help a person kill themselves, makes the case any less ambiguous simply because the patient asserts their authority. In another medical practice, Do Not Resuscitate, for instance, it is the opinion of the medical professional that holds sway. And it is in those scenarios the medical professional must assume moral responsibility. Whilst the proposals for a change in the law is to restrict ‘the right to die’ to people who have a terminal illness, with six months to live (Lord Falconer’s proposal), there is the problem that these groups do not simply go away once they have achieved their aims. As Dr Yuill points out, in the Netherlands, where euthanasia has been tolerated since the 1970s, the groups that support assisted suicide are now calling for the practice to be extended to elderly people. And it is not that these people are particularly nasty, it is down to the fact that their euthanasia policy suggests a low regard for human life. In chapter two we look at the key arguments of both sides. Neither side seem to see the question from a moral and/or philosophical viewpoint, yet from a humanist point of view this is the territory in which we define our attitude towards human life. Dr Yuill looks at the anti-assisted suicide argument first and rightly points to the fact that the principle of the sanctity of life is one that atheists can accept. It presumes the value of all human life and though the anti-assisted suicide lobby are largely made up from religious groups, this should not preclude us from sharing such a value. In fact there are seven suicides in the bible, the most famous being the suicide of Judas Iscariot. There is no condemnation of suicide and it wasn’t until the 5th Century that St Augustine’s treatise, The City of God addressed the issue of suicide and condemned it as a sin. Some say that he based his argument on the fifth commandment, ‘Thou shalt not kill’ others believe that the spate of suicides amongst the Donatists, an early Christian sect, who believed it was a solution to ending the torments of life on Earth, prompted the early Christian to declare suicide a sin. The most popular argument that the antis have is the slippery slope which states a that a casual approach to assisted suicide could be extended to other groups, and as we mentioned, Dutch pro-euthanasia groups have been calling for voluntary euthanasia for people over 70, giving ground to such concerns. The ‘Slippery Slope’ argument has always been problematical in whatever debate it was utilised because it does not rely on facts or reason, it relies very much on playing on people’s fears. It is a ‘what if...’ rather than ‘what is...’ approach, which is clearer on the ‘assisted suicide’ debate than any other debate I can recall. The strongest argument against assisted suicide is that it cheapens life in general. And when it comes down to categories, such as cancer, it cheapens the lives of all cancer patients. It suggests that all cancer patients will want to die. It assumes that because people suffer as a result of the disease that they will want to put an end to that suffering: that they will want to die. When looking at the arguments of the pro-assisted suicide lobby, compassion come out as the strongest and most widely used. The compassion argument relies heavily on emotion, as humans we don’t like to see suffering. If we find a dog that has been seriously hurt we don’t want to prolong that pain. But this isn’t about dogs, this is about human life; a life that is conscious of itself, that may well fight tooth and nail for those last few hours, irrespective of the pain. Dr Yuill tears into the compassion argument exposing it as ‘faux compassion [. . . ] a projection of the self onto the dying person or a pointless anger at suffering’. Or else it is a cowardly act of shifting responsibility onto the dying person. Yet suffering is not why people ask for help to end their lives. The 2009 Oregon (where assisted suicide is legal) Death With Dignity Act report noted: the most frequent reasons were loss of autonomy, decreasing ability to participate in activity and loss of dignity. As Dr Yuill notes, pain wasn’t even mentioned as a reason. But there is another, openly cynical argument, voiced back in 2008 by Baroness Mary Warnock, and that is that those elderly people suffering dementia had ‘a duty to die’. This speaks of a fear of dwindling resources and an aging population. But I think it also speaks to the victim age that we live in, where we are defined, not as individual people, but by an identity we chose for ourselves or is imposed upon us - so we are disabled or we have learning difficulties, etc. Dr Yuill goes on to give a concise history of the Right To Die Movement, explaining why it came about when it did, before moving on address the issue of suicide more deeply. He notes that not all suicides are ‘wrong’, and some can be noble; acts of heroism for instance. He then goes on to discuss abortion, which some view as the termination of a human life. He comes to some fascinating conclusions, in particular he situates the players in the Pro-life and Pro-assisted suicide as children of the 1970s, a period when both of these movements germinated. It was a period when pessimism began to spring up in response to the failure of the optimism that defined the 1960s. Though both of these movements would appear to be opposites, the association of the pro-life camp with religion, in particular Catholicism, and the pro-assisted suicide camp, which is associated with liberalism and progressives, they both take the very same view of humanity as their starting point: both see humanity from a biological, rather than a biographic, viewpoint. For both sides, the human being is a collection of cells and tissue: no different from any other animal. But it is because human beings are different from animals, in that they have a biographical existence and are conscious of that existence, that sets us apart from the rest of the animal kingdom. Whilst the pro-life movement may have opportunistically jumped on the assisted suicide band wagon, the comparisons with abortion are a misconception. The foetus is not a living thing in the human sense of the word, it has no biography and, as such, is only a potential life rather than an existing one. In the section on legislation, Dr Yuill illustrates how a law allowing assisted suicide would not offer freedom of choice but would deny the person that liberty. He makes an interesting and radical suggestion; that deadly drugs be made available to all adults. This would maintain freedom of choice as well as ensure our individual autonomy and moral responsibility. It would ensure that the doctor or family member could also act freely. As a society we tolerate mercy killing, what legislation would mean is that all parties lose the right to act responsibly. By allowing the state to impose itself on the privacy of the deathbed, we undermine the trust that exists between the individual and the medical profession or family member. The Liberal, Humanist Case Against Legalization is a powerful work coming as it does when the question of assisted suicide is being hotly debated. Labour peer Lord Falconer takes his cue from the Abortion Act in tabling a private members bill calling for legislation on ‘assisted dying’ and though the bill is unlikely to pass into law, the bill is increasingly gaining support. 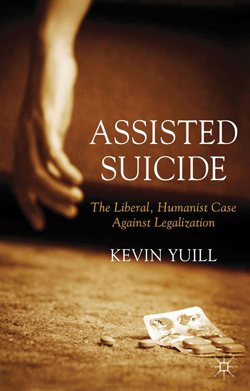 Dr Kevin Yuill’s book demolishes the arguments and viewpoints of the pro-assisted suicide lobby, but he also highlights the weaknesses of the views of those who are against such legislation, whilst recognising the strength of their concerns about the morality of bringing in any law that would give legal protection to doctors in their acts of mercy. Like the debate on abortion, the discussion about assisted suicide raises questions about what it means to be human. Unlike the issue of abortion, however, the assisted suicide debate cannot be reduced to a political or legal matter. The Liberal, Humanist Case Against Legalization shows us that there cannot be a ‘right to die’ because that exists, not as a right, but as a presumption. In these times when the liberal and ‘progressive’ response to any issue, particularly those to do with behaviour, is to call on the state to legislate, our lives are becoming a technical process. There are very few issues that are as personal as dying. If we allow for the state to interfere in that sphere we lose a most important aspect of human existence. Dr Kevin Yuill has produced a vitally important book that suggest that we cannot simply allow the pro and anti camps to fight this issue. This is a question that all of us need to address as human beings. Dr Kevin Yuill will be speaking at the Manchester Salon discussion entitled 'Assisted dying: does it benefit society? ', Monday 20th May.